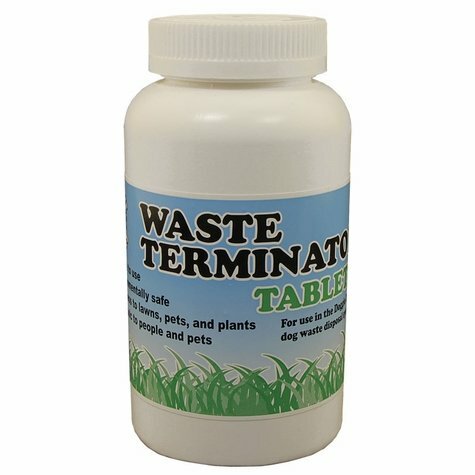 Doggie Dooley Waste Terminator Tablets - 100 tablets. $32.95. Use with your Doggie Dooley to help keep your yard clean and sanitary! Each Tablet contains billions of helpful waste digesting microorganisms which speed the rate of natural waste digestion. Strains are non-pathogenic and beneficial. For use in Doggie Dooley Dog Waste Toilet Models 3800, 3500, 3535, and Dog Septic Tank Model 3000. Directions: Add one tablet each week to your Doggie Dooley after adding water as directed. Add two tablets for two dogs. Cautions: Keep out of reach of children and pets. Wash hands after use. First Aid: In case of skin contact, wash with soap and water. If accidentally ingested, rinse mouth with water and contact a physician. In case of eye contact, flush eyes with water and contact a physician. May cause an allergic type reaction. Contents: Each Tablet contains billions of helpful waste digesting microorganisms which speed the rate of natural waste digestion. Strains are non-pathogenic and beneficial.